At LA General Insurance Marketing we have a complete non-emergency medical transportation insurance program, which is flexible and also which we customize for individual clients. We’re a full-service insurance brokerage for the non-emergency medical transportation (NEMT) industry in California. We provide targeted and reliable insurance products, which are comprehensive and affordable, and also exceed the expectations of every firm with which we do business. We are the only California-based insurance brokerage that is endorsed by the California Medical Transportation Association, and also we contract with the best possible insurance carriers. We’ll help you navigate California’s unique and rigid NEMT environment. We look forward to helping you. 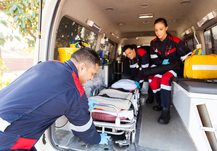 Non-emergency medical transportation (NEMT) insurance coverages come in many varieties, and as a result, choosing the right coverages can be a challenge. We’ll help you select the right coverages, and also we'll ensure that any policy or plan that you purchase is fitting. We handle all of our NEMT clients' needs, including quoting, claims, billing, and renewals. We’re our clients' exclusive broker-partners, and this is why we thoroughly assess clients’ needs and also ensure that our clients’ solutions are the best that they can be at all times. At LA General Insurance Marketing we’re proud to provide non-emergency medical transportation insurance in Los Angeles, CA, Pomona, CA, San Diego, CA, Fresno, CA, San Francisco, CA, Sacramento, CA, and the surrounding areas. We also serve other areas in the state.